Join us on Thursday, May 2nd from 7:30 – 9:00 AM at Anderson University’s New Student Center for Toast 'n Topics. 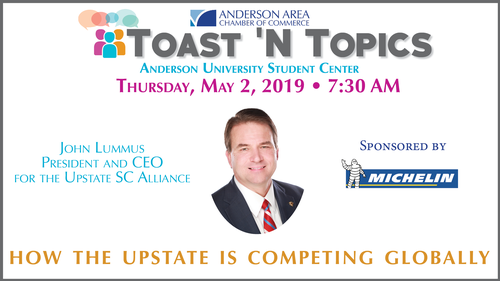 We will be hearing from John Lummus, President/CEO of the Upstate SC Alliance, regarding the Upstate's Talent Recruitment. Make your reservation now.